What a year! 2011 was fantastic and we look forward to 2012 with great expectations. We have an awesome line-up of classes and retreats. Make sure to look through the class & retreat listings and e-mail or call with any questions. In Celebration of our ten year anniversary (and one year Quilt Sampler Top Shop award), we are planning a week of awesome education experiences, door prizes, and additional drawings the week of May 29th-June 2nd. More information will follow as the time approaches! Mark your calendar to visit us during this week! As we move into the next decade, one of our big goals is to be more tech-savvy. We are making weekly blog posts to update you on the latest fabric arrivals and various news. If you go to our home page, in the middle of the far left column we have our blog link. (Make sure to leave comments!) Some time in January we hope to have our Facebook link up and going which will interact with the blog information. We have two new awesome block of the month (BOM) projects for 2012 (begin Feb. 1st). See pictures on this page. We fell absolutely in love with Stonehenge meets Jamestown. 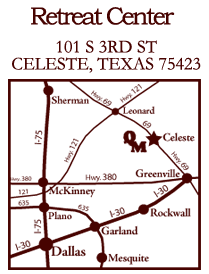 Any of you that participated in Marti Michell’s Ramblin’ Rose meets Jamestown—you will have all the necessary templates! Our other new BOM is Raining Cats and Dogs by Bunny Hill Designs. This adorable project is irresistible. Sign up because space is limited! Samples will be on display very soon. All of our available BOM’s are listed online. We have eight in total. Make another masterpiece this year! Join us at the “Marti and Me” Club where each month we will explore a different tool from Marti Michell. See classes by Jo Ann Cross for dates. Join the “Marti and Me” club and you’ll be accurate, too! Remember, accuracy is what makes your hobby less frustrating, more productive, and more fun! Is 2012 the year you want a new sewing machine? Elna has just the right embroidery or sewing machine for you. Come take a test drive. Have an Elna that hasn’t been cleaned in a while? Be kind to your investment—call and make an appt. soon. Do your back muscles and shoulders hurt after sewing? You might need one of our Sylvia sewing tables (we have discounted demos & they fit all machines!) or a sewing chair. We have several new notions on hand for you to see. The Slice by Fabrique is a cool new fabric cutter that uses design cards to operate a small cutting blade. June Tailor has a handy new quilt binding express mat. We have new dies for the Go! Systems. The new flip light by Ottlite is a very handy portable cordless light. We have a couple of the Ottlite units pictured online. Also just received is the thin line light panel by Porta-Trace with LED technology. Tracing applique patterns will be much easier! Another big goal in this year—bring lots of national teachers to Celeste, TX. We have some awesome national teachers that you see every month in our class schedule, now we plan to fly in some others. Make sure to check our blog & retreat website often so you don’t miss opportunities. Thanks so much for your continued support. We wish you a happy new year and hope to see you soon. Alice Wilhoit Handwork Retreats May 4th-6th($175) or June 4th-7th($180). Proprietors of The Buggy Barn!! We are flying in these two awesome teachers from Spokane Washington for an all day class on Friday April 20th, 10-4. Cost is $85. This is only $10 more than if you went to their shop! This duo teaching team will dazzle you with their trunk show. 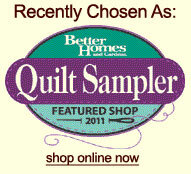 Choose from any of their numerous patterns or books and learn a quick-cut method. They LOVE beginners too! The technique is the same unique style Buggy Barn is known for throughout the country. Some projects are more complex. Pick your project and learn from the masters! This is their only Texas opportunity this year! Applique with Alice Series Saturdays: Jan. 7th, Feb. 4th, March 3rd, from 10-2 for $15. Are you interested in applique? Are you already "hooked" on applique? Alice can take you from where you are and help you get to the next level. Alice is an accomplished teacher that travels around the United States sharing her talents with hundreds if not thousands of quilters. Make sure you take advantage of having this awesome teacher. She can help you with any applique method. The Baltimore Liberty group is using the freezer paper starch method of applique. This is a wonderful method used to make the Balitmore Liberty quilt by P3 Designs. If you prefer you may bring any project you are working on; Alice will be here to help you with any questions you might have concerning applique. Don't miss the fun, fellowship, and continuing education each 1st Saturday. Wool Applique & Silk Embroidery Fri. Jan.27th or Sat. Feb. 18th, 10-4 for $40. Wool is fast becoming a favorite way of appliqué. In class you will learn techniques using wool, embroidery and silk ribbon as you construct a lovely basket block. Fireworks Wed. Feb. 29th, 10-4 for $40. Let’s celebrate Leap Day by making a fabulous quilt for July. You’ve got that extra day so let’s use it!!! We’ll cut the kit (this is optional), you just come and sew!! This is a curved pieced project. Believe it or not it is simple piecing! Students are always amazed at the results they get in such a short time. Join us and make this stunning project in original colors or venture off with a light background. Basic Hand Embroidery Wed. April 4th, 10-3 for $40. Spend a few hours with Alice and learn how to embroidery or to brush up on those stitches. This is a technique class. All you need to bring is scissors and a hoop! Everything you need is furnished in a kit. She will also show you some products that make embroidery so much faster! You will have a fun day of stitching. Beginning Quilting Sat. Feb. 11th or Sat. April 21st (9:30-4 for $35). This class will take you from cutting to binding in one six-hour class. We will cover rotary cutting, simple piecing, borders, making the sandwich, machine quilting, squaring the quilt, and binding. What’s the catch? The project will be a candle mat or table topper. The only way to experience a “quilt-in-a-day” is to make a very small quilt. I will share a wealth of quilting knowledge and tips with you as you make this small project. This is for students who are truly beginners and need an introduction to our craft. 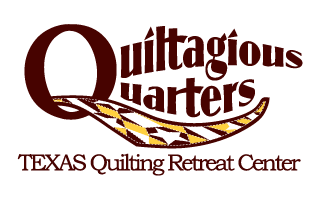 Tell your non-quilting friends so they can become quilters too! Kindergarten Machine Quilting Sat. April 28th. Do you just make tops? Is the cost of having everything quilted for you stifling your creativity? This class teaches you the basics of machine quilting. Straight line, free form, quilt-in-the-ditch, outline, grid, channel, and stipple quilting will all be covered, plus basting, marking and binding. Come learn how to finish your entire project yourself! Basic Machine Applique Thursday Feb. 2nd or Sat. March 17th. This class includes instruction on three popular techniques. The first is fusible web outlined with a blanket, zig zag, or blind hem stitch. Any simple zig zag sewing machine will work. The second is mock hand applique that creates a hand picked look that will fool everyone. The third uses fusible interfacing or Solvy stabilizer to turn the edges before sewing them down. After practicing in class you can decide which you enjoy the most. Lone Star Saturday January 14th or Thursday Feb. 16th. This is the fastest Lone Star method in East Texas! PERFECT points without much effort at all. Forget everything you know about making a Lone Star quilt. This method has no angles, no templates, no strip sets, gives you perfect matches, and a flat center. Not only that, it is an easy and fast project using Quiltsmart. New sample! The ULTIMATE Sampler! Join the craze known as Dear Jane...recreate this Civil War era quilt with it's small, interesting blocks and triangles, mainly by machine with applique blocks by hand. This class is taught by technique and you are guaranteed to come away learning a shortcut or two and/or new techniques. Let Sarah help you with fabric selection. She will take all the "wonder how she made that one" out of it for you. Dear Jane book required. Class meets Feb. 11th, April 14th, & May 12th from 10-3 and the cost is $10 per class. Level 1: Basic Pantograph Long Arm Quilting class Wed. Jan. 25th, Feb. 15th, March 7th, March 28th, April 18th, or May 1st, 9:30-3:30 for $150. Learning to stitch a pantograph pattern on your quilt is an easy and fast way to make your quilt look like you had a professional quilted it. The basic steps will get you started on learning how to put a nice pantograph design on your quilt. Jackie will teach the six steps to get started becoming a confident long arm quilter. Level 2: Custom long arm quilting class Wed. Jan. 11th, Feb. 1st, Feb. 22nd, March 14th, April 4th, April 25th, or May 16th, 9:30-3:30 for $200. Would you like to learn how to make your quilts stand out with some custom quilting? This class will teach you the basics of custom quilting. It’s fun and you can use your creative mind to enhance your quilt. You can say you quilted it and had fun doing it. Jackie will teach seven steps to get started becoming a custom long arm quilter. Level 3: Artistic Custom Quilting class Wed. Jan. 18th, Feb. 8th, Feb. 29th, March 21st, or April 11th, 9:30-3:30 for $250. After completing Level 1 and Level 2 classes you are now on your way to Artistic quilting. This class will take you to the level of a professional quilter, with lots of practice, patience and determination! You can make your quilts stand out in a crowd. Your family and friends will ask if you had a professional quilt it, and you can proudly say, “I quilted it”!! Jackie will teach the six steps to getting started to becoming a Artistic Long Arm Quilter. Farmers Wife Sew Group-Fourth Saturdays 12-3 for $5 (see dates below). Jo Ann is working you through this wonderful project which will refine your piecing skills. Come see the beautiful sample Jo Ann has completed! We have a great group of ladies in this group. Several methods can be used on these blocks. Jo Ann will show you several options. You pick your desired method. You CAN do it! 1/4” seam allowance and patience are all that is required—Jo Ann will help with these! Marti & Me club days Join the current six month series 10:00-11:30 fourth Saturday each month, unless noted, Jan. 28th, Feb. 25th, March 24th). Join this club ($30) to learn how wonderfully a perfectly cut project will sew together. Each month Jo Ann will introduce a new project and tools. Precision engineered corners, permanently marked identification system and cutting by the number are innovations that you will find on From Marti Michell templates. Who better to show you how to work accurately and piece those perfect projects than Jo Ann? Being a club member has great benefits. Discounts on club day and some awesome patterns! Six patterns are included in your membership even if you don’t make to the club dates! Rapid Fire Hunter’s Star Sat. Jan. 21st, 9:30-3 for $30. Make this beautifully striking project without difficult trapezoids! With this new ruler everything falls into place with great accuracy by sewing strips, cutting , and then sewing again into oversized blocks. This versatile tool helps through the whole process to cut shapes, guide with trimming and eventually to square up the block. Once Bettie leads you through the process, the sky is the limit. Slice-n-Sew Snowball Wed. Jan. 11th or Sat. March 31st, 9:30-3 for $30. This stunning project can be made with ease. Let Bettie, the designer of the pattern, assist you in creating this beautiful quilt. Scrappy and fun with a trick for circles, it looks hard but isn’t. This project can have a four patch or nine patch as the alternating block. New sample is hanging in the class room of our store that is BEAUTIFUL! Painless Paper Piecing Thurs. March 1st, 9:30-3 for $30. A better than ever method of paper piecing. (You do NOT sew through the paper.) Guess what? No more tearing off all those little paper pieces. Use one piece of freezer paper over and over. This session the project will be a mini “Goose Chase Log Cabin.” This striking sample is hanging in the store. Learn to paper piece the painless way! Sit-n-Sew is every Tuesday from 9:30-5. We have a wonderful group of ladies that would love to include you in on the fun! With our large well lighted class room area, there is room for all. Every 1st Tuesday we all share snacks, stories, and projects. The store provides door prizes and we share what new items have arrived. When you park for sit-n-sew please make sure not to block the front of the building or the mailbox. This would be greatly appreciated. Week of May 29th-June 2nd. Teacher demos Sat. June 2nd!! !